Nothing marks a celebration quite like sipping on a classic margarita. These delicious drinks can pack quite a punch where the alcohol content is concerned, which is what often makes it a favorite among partygoers. With Cinco de Mayo right around the corner, now is the perfect time to learn how to make classic margarita recipes. Oftentimes, the uneducated will opt to make a margarita recipe out of cheap tequila and a pre-made margarita mix, but what they don’t realize is an authentic margarita recipe only requires three ingredients. Why then, would you subject your party guests to overly sweet, high-calorie store-bought mixes, when you can make a traditional margarita easily at home? If you choose to educate yourself on what goes into the perfect margarita recipe, your guests will thank you. Whether you prefer a quick margarita recipe, a classic margarita recipe, or a frozen margarita recipe, the following article from Divine Dinner Party covers it all. Now you will be able to provide your guests with fun options, none of which include a pre-made margarita mix. Now, if you’re looking for a simple margarita recipe, you might be looking for a number of different things: a recipe for frozen margaritas you can whip up for party. 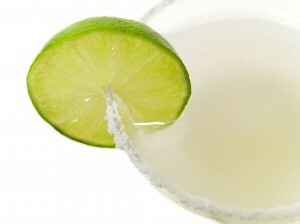 Or an authentic and very simple margarita you can make anytime. Or an ultra-flavorful classic margarita on the rocks. Chances are, if you’ve come here looking for an easy, simple, and authentic margarita recipe, you’ll find something that fits the bill below. Our three types of Mexican margaritas cover the whole spectrum, from a minimalist margarita, to a genius margarita with a bit of prep, to a simple and perfect frozen margarita. So read on! And if you’re making margaritas because you’re planning a Mexican fiesta, check out Mexican Party Food and Planning Central for more tips, including more authentic Mexican drinks to make for your party! If you’re really looking for a TRULY simple margarita recipe –but one that tastes wonderfully authentic and uses real ingredients– this is the one! It couldn’t be faster to make or easier to remember… but you probably wouldn’t be able to find a more authentic margarita recipe anywhere. With a quick margarita recipe like this in your arsenal, you’ll never buy margarita mix again. Instructions: 1. Mix all ingredients (you can make a huge pitcher, if you like). This recipe, based off of one created by genius of Mexican food, Rick Bayless, is just about the definition of a simple margarita recipe: it’s not full of strange fruits or weird pre-packaged ingredients. Instead, it’s a margarita recipe at its very best: served on the rocks, un-watered-down, and allowing the flavors of the tequila and lime to really, really shine. A little more time is involved than with some margaritas (you have to let the lime syrup sit at least two hours), but this traditional and classic margarita is 100% worth it. And once the prep is done, it’s ultra easy, especially if you want to make a big batch. Recipe serves 4. Triple (or more!) it up if you’re planning a big Mexican party. Instructions: 1. Combine zest, lime juice, sugar, and water. Cover and chill for 2 to 24 hour. 2. Strain through a fine-mesh strainer into a large shaker. 3. Add tequila, Grand Marnier, and ice. Shake about 15 seconds. 4. Strain into chilled martini glasses, with ice (on the rocks) or without. Tip: Like a salt rim? Rub the glasses with lime and dip in salt prior to filling. This simple margarita recipe makes a truly wonderful frozen margarita… clean-tasting, lime-y, and with just the right amount of tequila (though you can adjust it up or down to your tastes!) When hosting a Mexican fiesta with a lot of guests, I like to make several containers of the limeade-cointreau-tequila mixture, and just pop them in the blender when I’m ready… it takes some of the mixing work out. Instructions: 1. Dump the limeade, Cointreau, and tequila in the blender. Add enough ice to make about 40 ounces of margarita (adding ice bit by bit). Blend til smooth. 2. Rim margarita glasses with salt if desired, and serve immediately. Your Cinco de Mayo party is bound to be a smash hit if you use one (or all) of the above margarita recipes. If hosting your own Cinco de Mayo party isn’t on your agenda, consider visiting one of Acapulcos Mexican Family Restaurant and Cantina’s 12 locations throughout Massachusetts and Connecticut. Each year we have exciting festivities planned for Cinco de Mayo, including a special drink and food menu. Or, you could stop by anytime for an authentic margarita! We have an array of margarita varieties to choose from.